Path Mapping replaces crawled url/path with given one. In search result page, replaced url links are used. Select Crawler > Path Mapping in the left menu to display a list page of Path Mapping Configuration, as below. Click a mapping name if you want to edit it. Click Create New button to display a form page for Path Mapping configuration. Target string which is written by a regular expression. When this is processed. 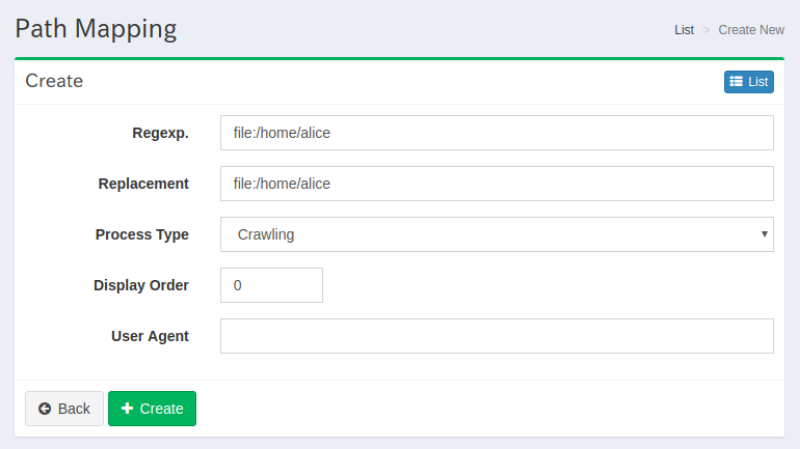 Crawling is at crawling/indexing time and replaced url/path is indexed. View is at searching time and original url/path is indexed. Click a mapping on a list page, and click Delete button to display a confirmation dialog. Click Delete button to delete the configuration.